Light up and learn with the spin & learn Color flashlight from VTech. The toy flashlight excites as it glows with a rainbow of five colors and plays exciting songs and music. Change the colors and listen to five fun animal sounds as you spin the dial and learn about colors and animals. Press the engaging ladybug button to hear phrases and sounds that teach numbers to playful melodies or Count along and learn the numbers 1, 2, and 3. Over 50 sing-along songs, music, sounds, and phrases engage learning fun. 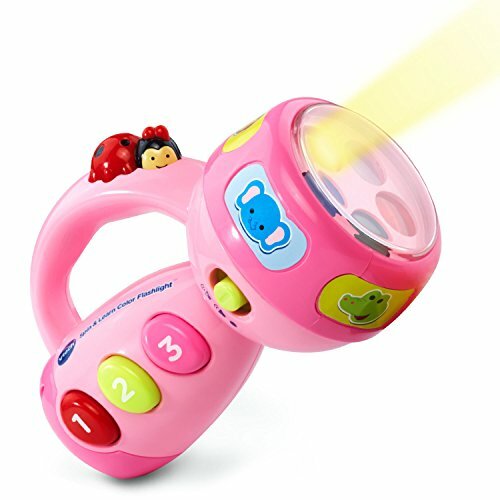 With its easy-to-grip handle, your toddler will want to take this learning toy flashlight with them on every adventure.